I used this case to hold a Mackie 1604VLZ Pro, and it did a good job. Light enough to move easily, but solid enough to offer good protection. If you don't want to buy a proper flight case, it's a good product. 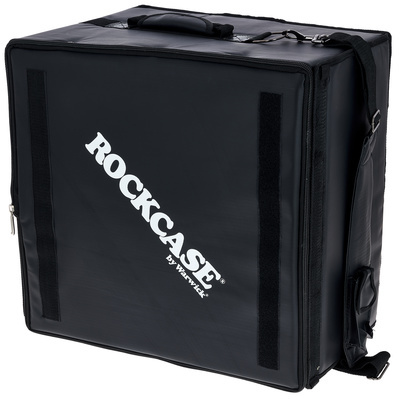 I bought the Rockcase for my Helixboard 24 to protect it in the pro space from dust and to make live recordings. In addition to the mixer I have a Samson S-Com and a Lexicon MX200 installed. For smaller gigs, the big siderack can stay at home. The weight and thus the transport are a dream. The handling is not so great with regard to the Velcro fasteners, since these do not hold and slip, cables or what else else in the case. I have therefore installed several reclosable cable ties which hold the flaps. The processing also leaves something to be desired. My case had already broken the wooden frame. Together the whole thing is actually by the equipment :) The zipper zipper was lost after a short time and was replaced by wire. The zipper was always a bit difficult. When I got it, I thought it was a wrong investment, but I've been using it for two years now and has become accustomed to the small quirks. In view of the price and the weight, I am therefore satisfied. ID: 191175 © 1996–2019 Thomann GmbH Thomann loves you, because you rock!